The Global Refining Summit features a split programme with each conference room focussing on either the technical or strategic aspects of the refining industry. Due to the rapidly increasing markets in developing countries, the availability of pre-owned equipment becomes more and more valuable. 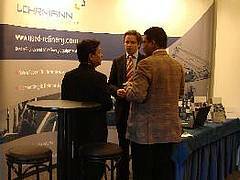 The fact of the large number of inquiries at LOHRMANN's booth, confirms the strategic importance on considering the implementation of pre-owned processing units into project planning and executions, as well as relocations of entire refinery facilities.